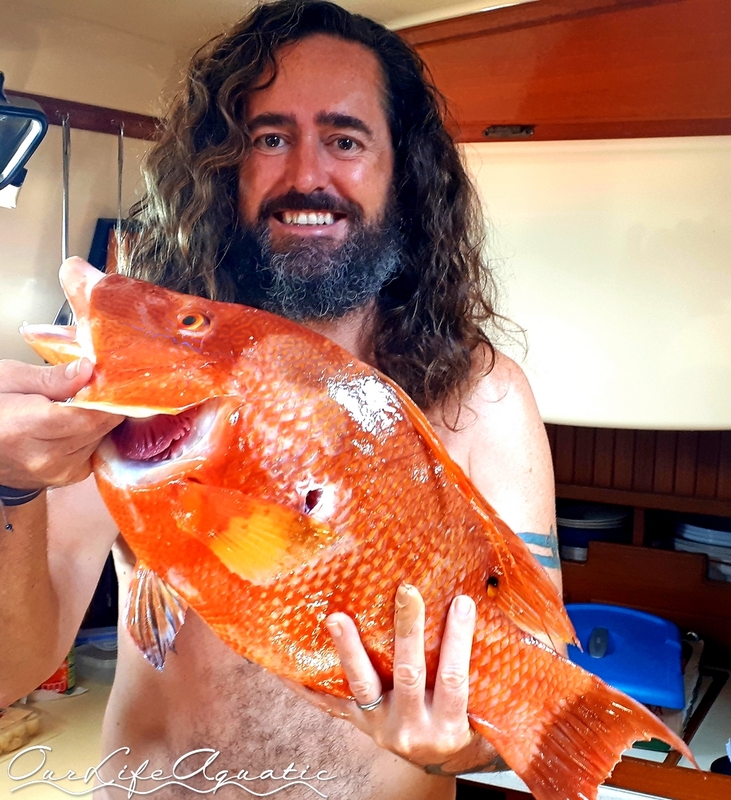 There is no way to write a single blog about the Guna Yala land and waters (also known as the San Blas), and the Guna people, and do them justice. So we will break this up into three parts starting with the most important: the people. A large portion of the Caribbean coastline of Panama is autonomously governed by the Guna people, and the nation is referred to as the Guna Yala, which translates to “Republic of the Guna.” It is unique in that it offers visitors a glimpse into a well-preserved, pre-Spanish, American culture. The Guna welcome visitors, but strictly prohibit intermarriage and property ownership by outsiders. With the exception of a couple of villages that have embraced modernity, the Guna live by the traditional ways of their ancestors from centuries ago. The people themselves are small in stature, well tanned, dark-haired, peaceful, and friendly. Crime is almost unheard of in the Guna nation, making this area one of the safest places we have visited. We never lock our boat at night or worry about things left out in the cockpit. The Guna may ask you for things that might help them in their daily lives, but taking them without permission is anathema to their culture. 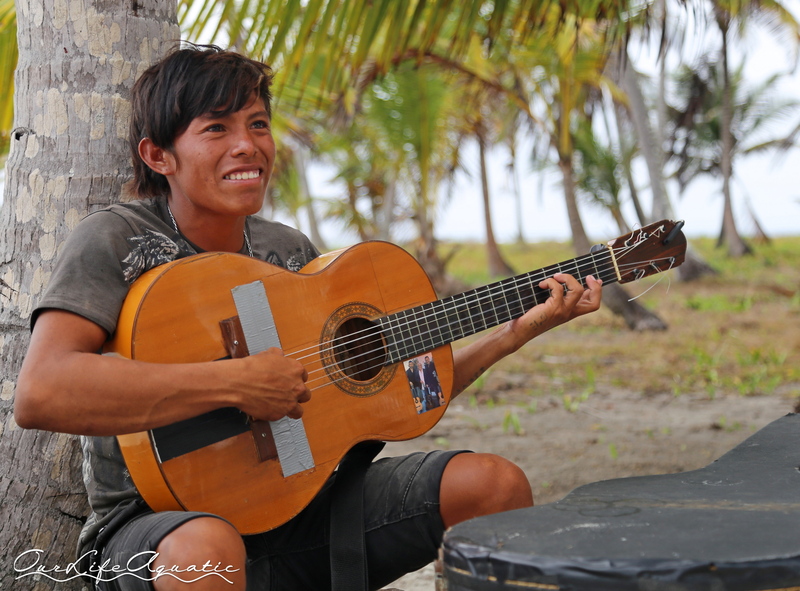 The Guna make a living off the land, the sea, and their handicrafts. Most men are either fishermen or farmers, or a combination of both. The farmers will harvest coconuts on the islands as well as from farms in the mainland rainforest. Until several years ago, coconuts were the main currency for the Guna. We are told that every single palm tree belongs to someone, even the ones in uninhabited islands. For that reason, we buy our coconuts from locals instead of harvesting them ourselves. An “ulu” is dugout from a single log and takes about a month to make. Fishermen row out early in the morning in their small dugout boats, called “ulus.” They usually fish until late in the afternoon and will often stop by anchored sailboats to offer their fresh catch of fish, lobster, crab, or octopus. 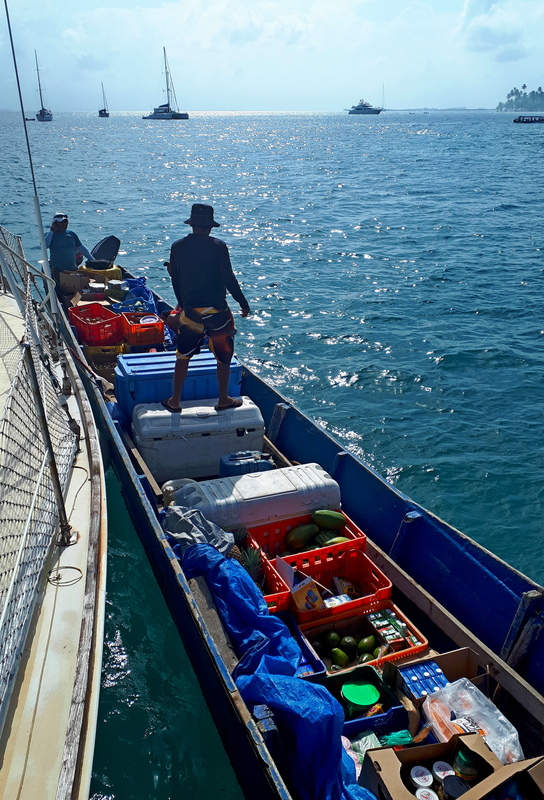 The bulk of their catch, especially lobster, is sold commercially at a small airport where waiting single-engine planes purchase it to take to market in Panama City. 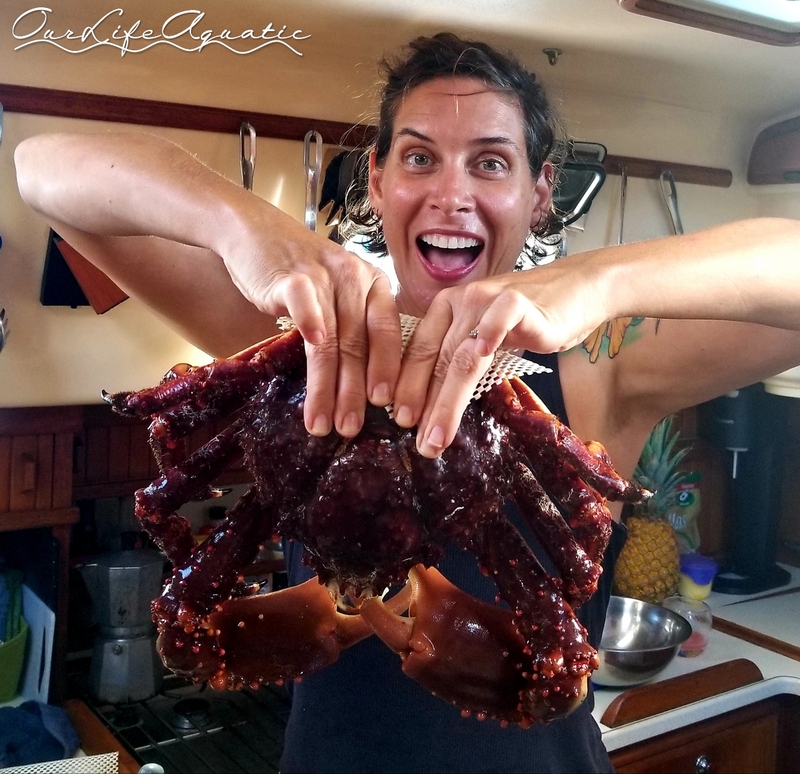 A huge crab for under $10! Enough for four meals! 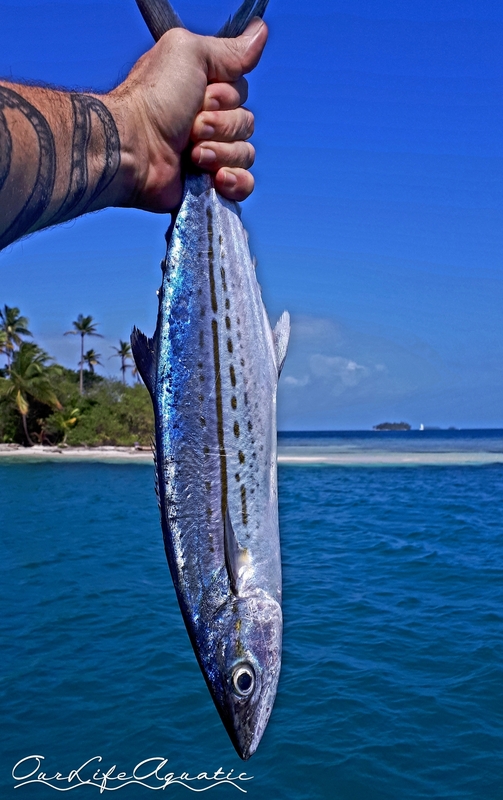 Holy Mackerel! Delicious, and fortunately, quite common in these waters. Most women, and a few men, do not farm or fish. 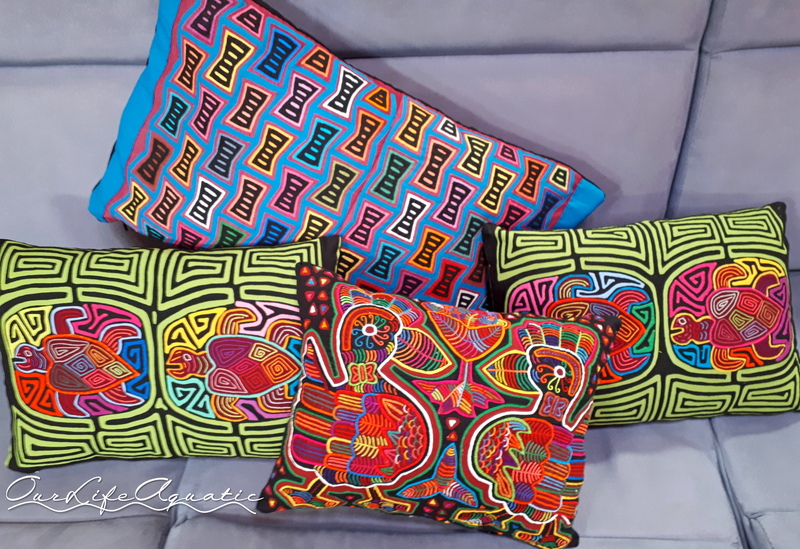 Instead, they make intricate, multicolored appliqué cloths called “molas” that can be sewn into shirts, cushions, and displayed as artwork. The themes of the mola art vary from abstract patterns to birds, marine life, and flowers. The women also make jewelry out of tiny beads that they sell and use to adorn their legs and arms. In the more traditional villages, the women all wear mola blouses, and their legs are covered in jewelry from their ankles to their knees. 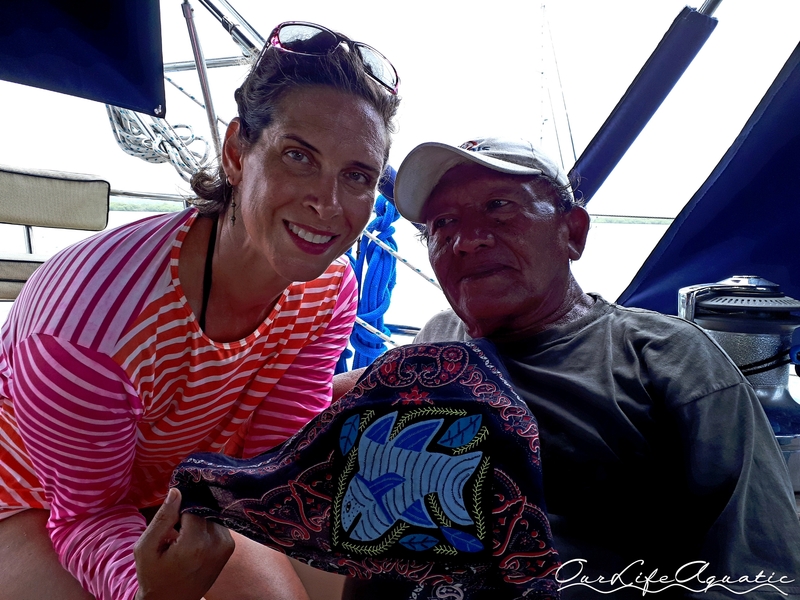 Buying molas from an islander. They usually display them on a hut wall. On the mainland rain forest, the Guna walk wherever they go. Some farmers have told us that they have a daily walk of over an hour each way to get to their farms. In the evening, they return laden with coconuts, bananas, and other fruits and vegetables. If their farm is near a river, they use their dugout canoes to facilitate moving goods back to their villages. Ladies rowing away from Pura Vida after offering us molas and taking a short break. 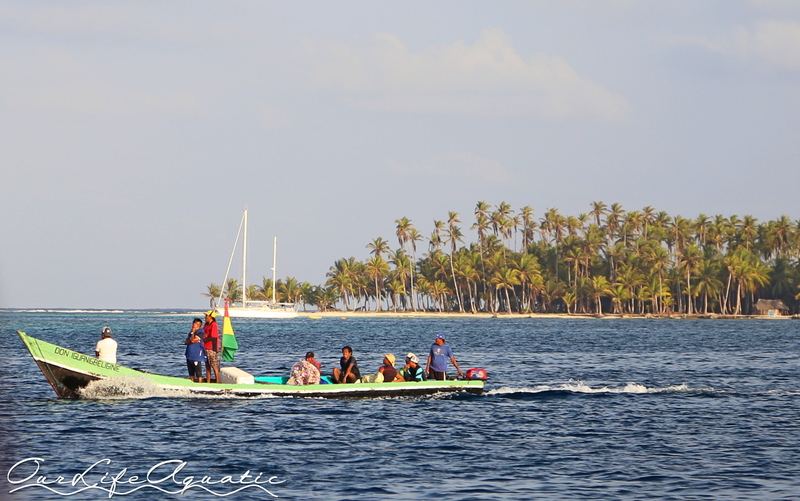 The Guna who live on the islands or make their living from the sea travel by ulu. They will row for hours when going upwind, and hoist a wooden mast and small sail for the return trip. 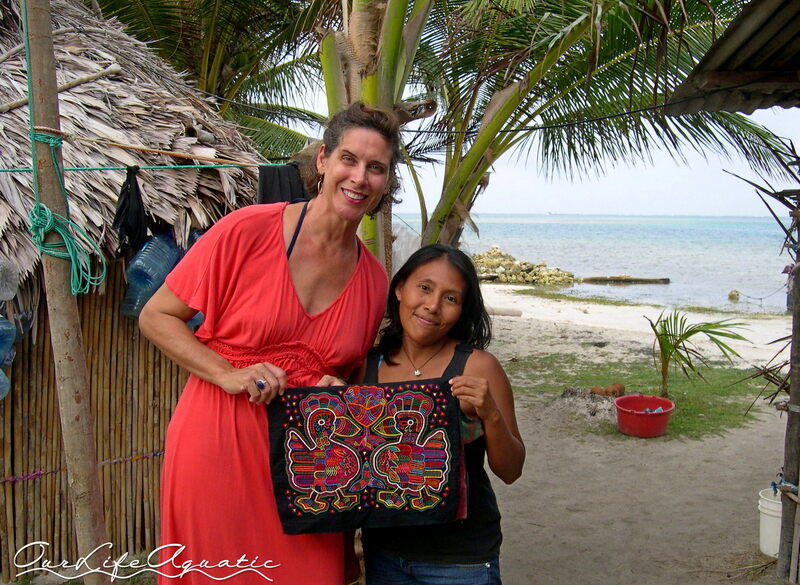 We have been visited by ladies selling molas who have traveled several miles rowing to get to us. Their lives are quite simple. 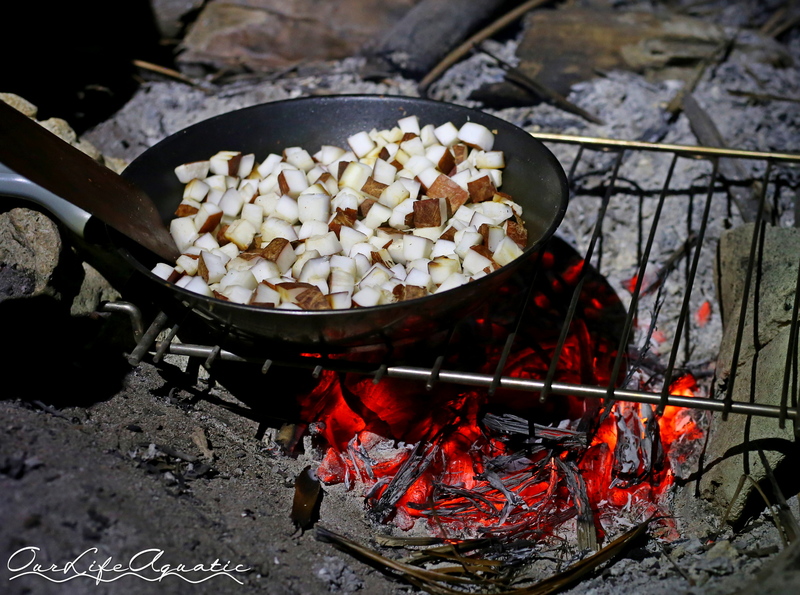 They live in thatch huts with only hammocks for sleeping and makeshift log tables for food preparation. They cook over log fires and have no electricity or running water. This is a fancy Guna island hut, most are much simpler. There are some modern conveniences taking hold. 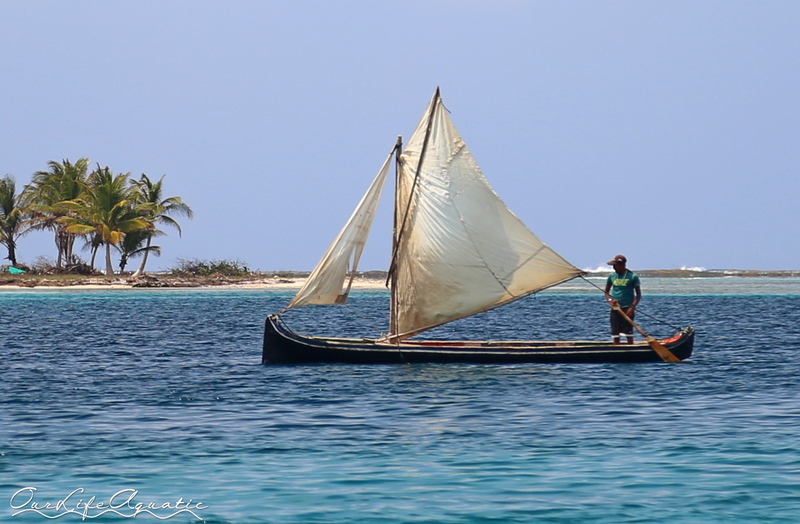 For traveling greater distances, some Guna have medium-sized wooden boats, called “pangas”, with outboard motors. 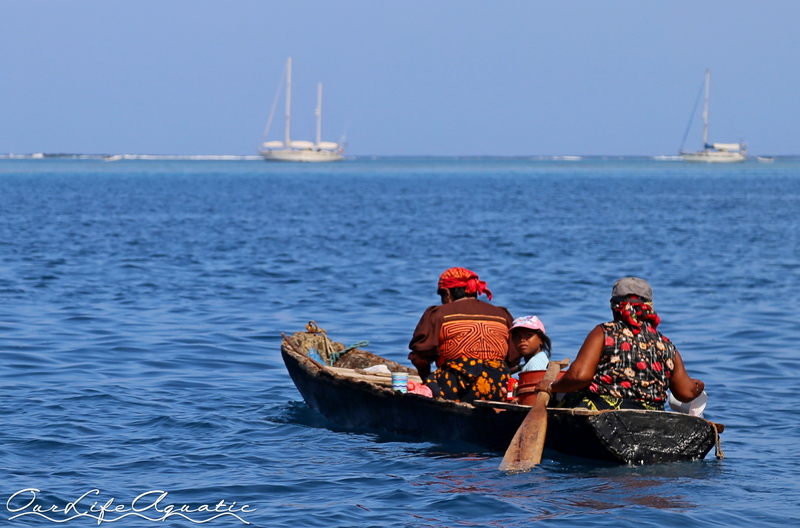 These can be seen moving entire families among the islands or hiring themselves out as water taxis. 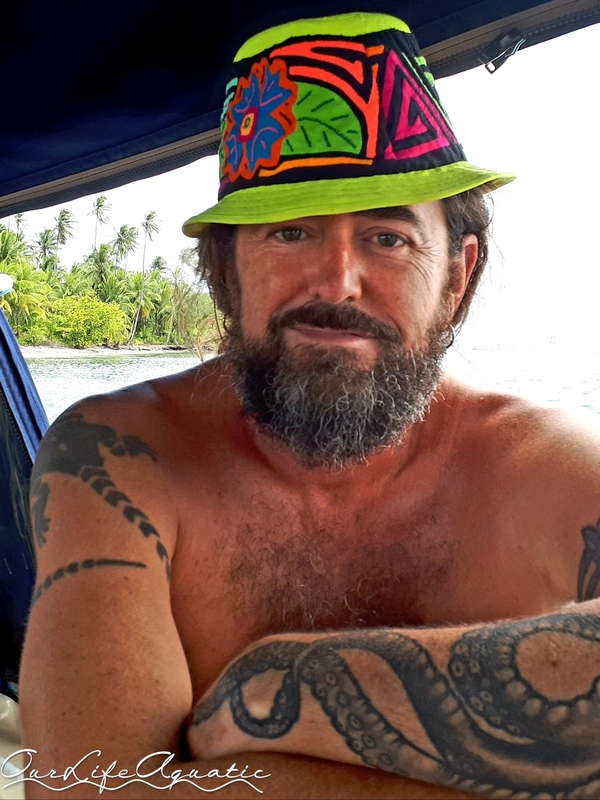 When we are anchored near an island that hosts tourists for the day, or campers for a few nights, we see the pangas arrive early in the morning loaded with pasty-white tourists in swimsuits looking to soak up the sun in this remote paradise. Our favorite pangas are the veggie boats. These entrepreneurs will make weekly runs inland to buy produce, meat, eggs, bread, rum, wine, cooking supplies, and other groceries. They then service the outer islands and cruising sailors in the popular anchorages. With the addition of cellphone towers in the area a few years ago, this business has boomed. 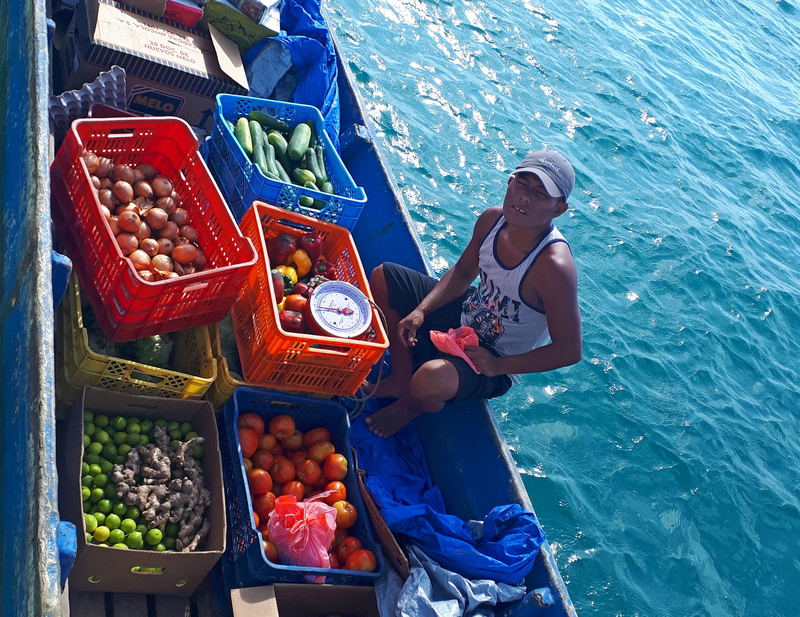 The veggie boat guys – it’s all men – will take your order via WhatsApp and tell you when they will be in your area. We have even been able to get small boat parts from one of the boats that gets their supplies all the way in Panama City. The service can be quite customized. Our last veggie boat guy messaged us from the grocery store with pictures to ask what brand and type of powdered milk we wanted. Now, that’s service! Many of the islands where we anchor are quite small and uninhabited, but in some cases, a family or group of friends will live on an island as caretakers. Some do so on a monthly rotational basis and live in a village the rest of the time. 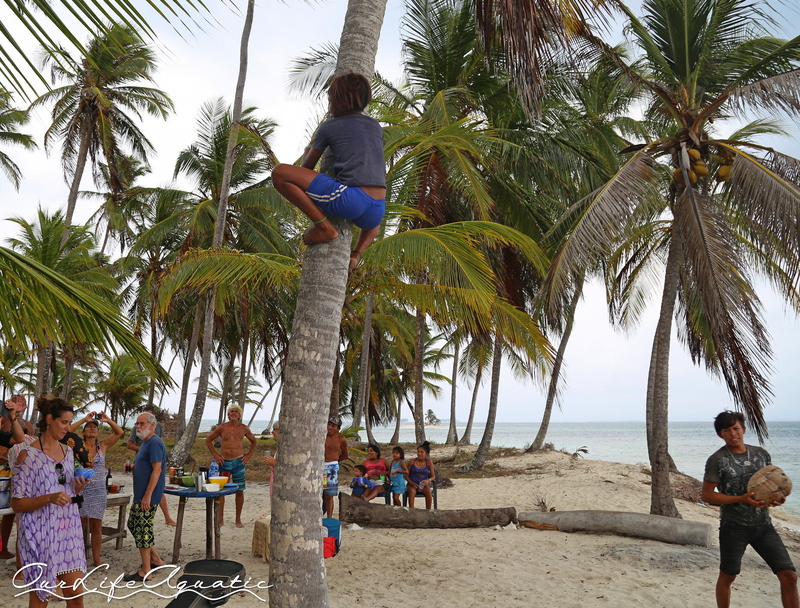 When we go ashore, we always visit the local household to introduce ourselves and ask for permission to use their island. They always greet us with smiles and welcome us to their land. In rare cases, they request a one-time usage fee of $1 or $2 per person. This has only happened, however, in the islands that make their living from visiting tourists. 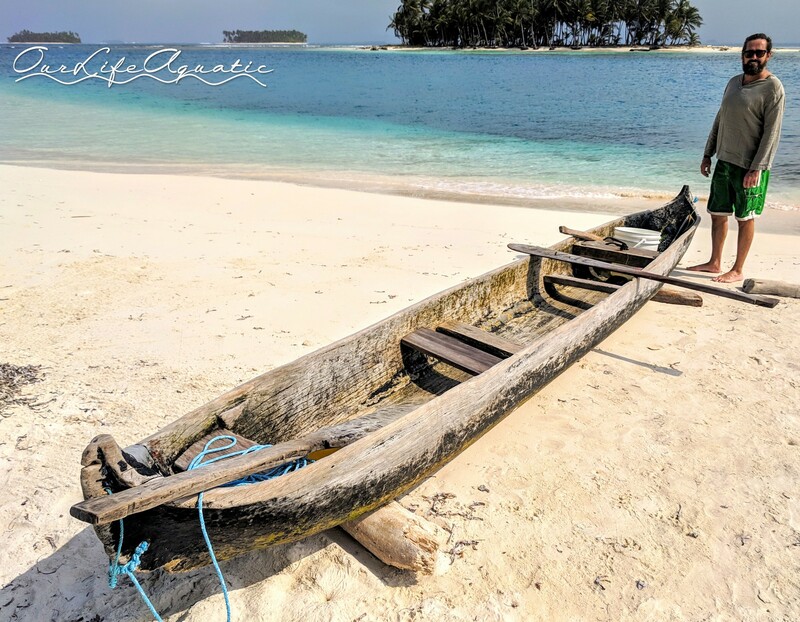 These small fees are well worth it to enjoy a slice of these pristine tropical isles; and the caretakers will usually clean the beaches daily and help you collect wood for bonfires if you ask. 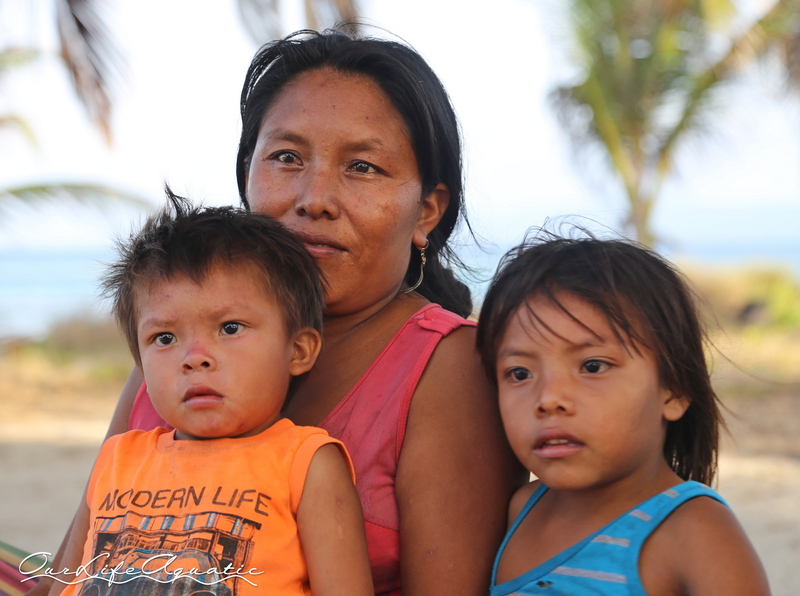 Guna families are matrilineal. The ladies control the household finances, choose their husbands, and the husband moves in to the wife’s family compound. In every occasion where we had to pay for goods or services and a Guna woman was present, the men deferred to the lady for exchanging money. 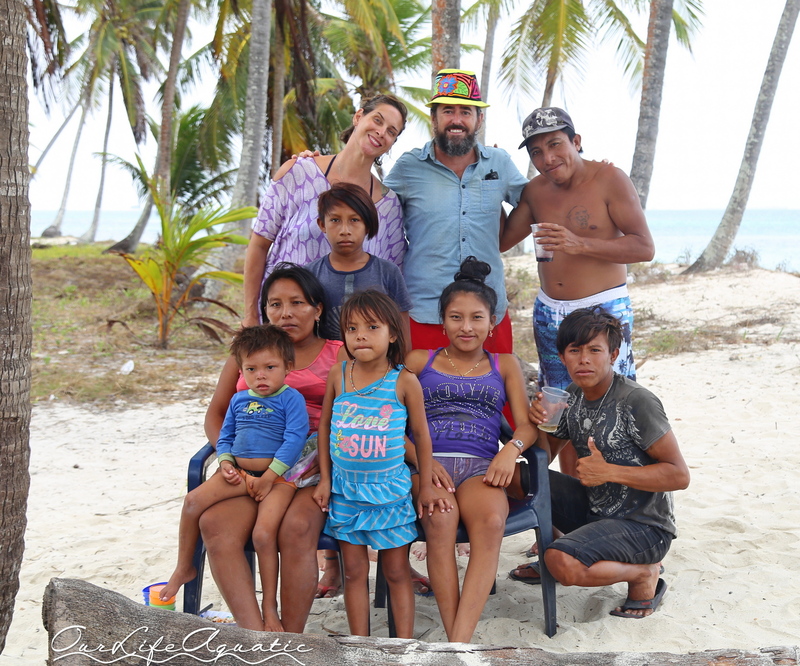 We recently befriended a man named Richard and his family on a small island. He did all the talking in Spanish as his wife and children spoke only Guna. When we asked if we could buy coconuts, he sent a young boy to gather them for us and he personally gave them to us and told us the price. When we reached out with money, however, he waved us off and pointed to his wife. Without saying a word, she smiled and collected the bills. 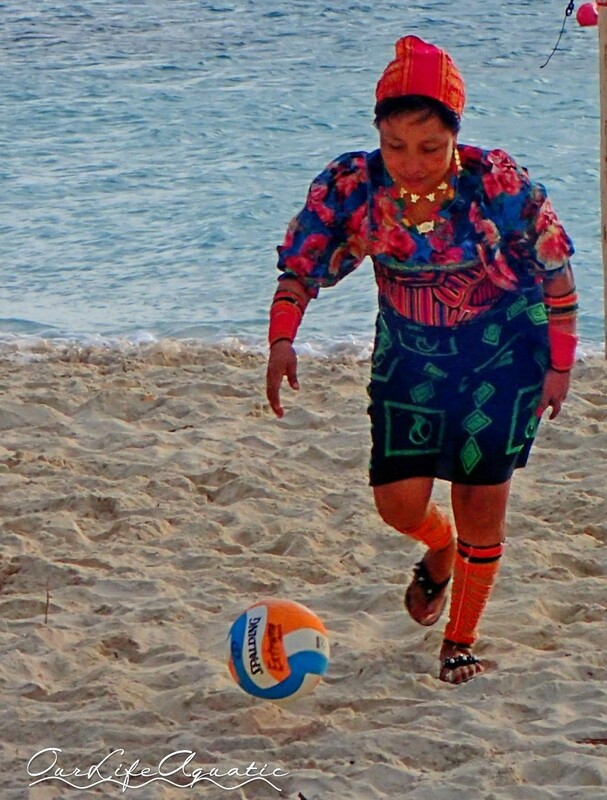 We have encountered a few transvestites in the Guna Yala and have learned that some men dress up and live as women. They adorn themselves in the traditional molas and bead jewelry, and wear more makeup than most of the women. 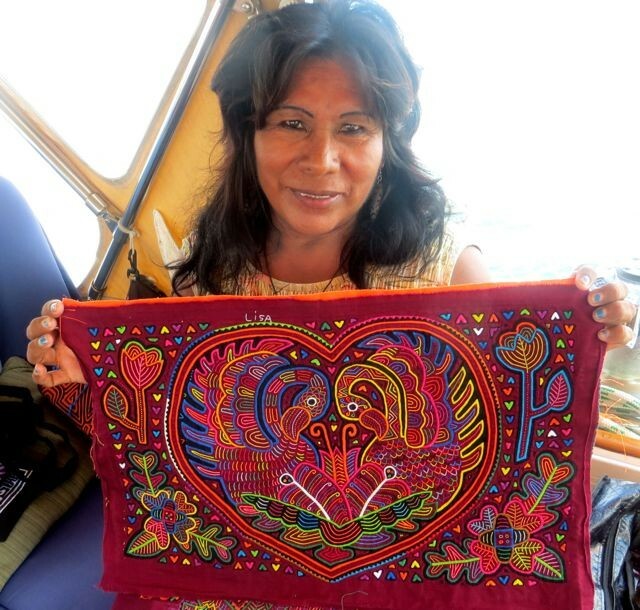 One particular lady calls herself Mola Lisa and is famous as a master mola maker and tour guide. She is frequently seen rowing with a male companion to anchored yachts to introduce herself and offer her artwork and tour services. It appears to us that the Guna are completely accepting of transvestites and gender fluidity. 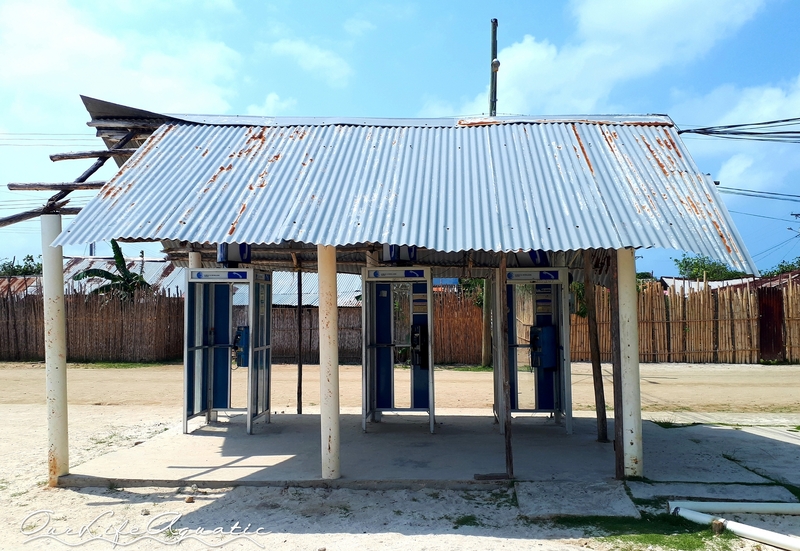 Until cell phone service was established, the phone booths in the large villages were the only way to communicate. This is the largest phone bank in the Guna Yala. View from the anchorage at Ustupu, one of the largest villages. With many signs of the outside world starting to make their way into Guna culture, we wonder how long the Guna will be able to maintain their traditional life. Most Guna now have cell phones, for better or for worse. This is sometimes funny, because they do not have electricity outside of their large villages. We were recently visited by a man asking if we could charge his cell phone aboard so he could call his family on the mainland later. We were happy to help. Most of the Guna we have met speak Spanish. While some of the older people only speak the local language, we learned that most children now study Guna, Spanish, and English. 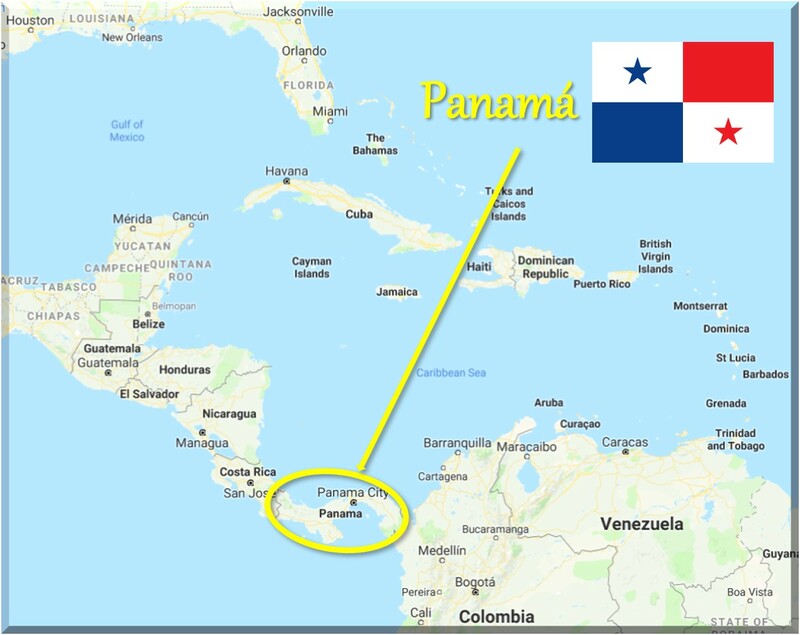 Some even leave to attend the university in Panama City after they complete their local studies. This is another sign that this unique culture may be on a collision course with the outside world as the younger generations embark on more worldly experiences. Federico visited us and presented Kimberly a gift mola made by a young, blind woman to thank us for helping his charity for the handicapped. 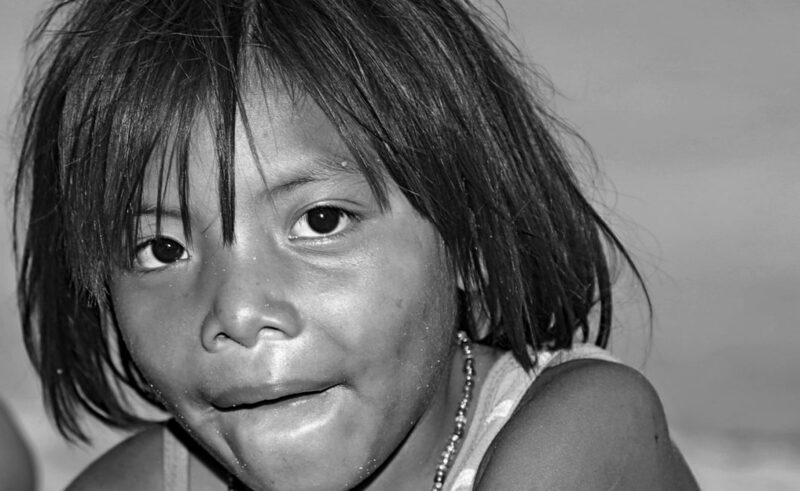 In Nargana, the most modern village in the Guna Yala, the children are not shy. These two cuties hustled me into a basketball game and chatted my ears off. We feel incredibly fortunate to be spending time with these amazing, kind people. Most tourists only get a small glimpse of this culture, but we have been here for a few months and have enjoyed every minute. After traveling from the more remote and traditional eastern villages into the more modern and populated western areas, we are beginning to get a feel for the differences in the locals. 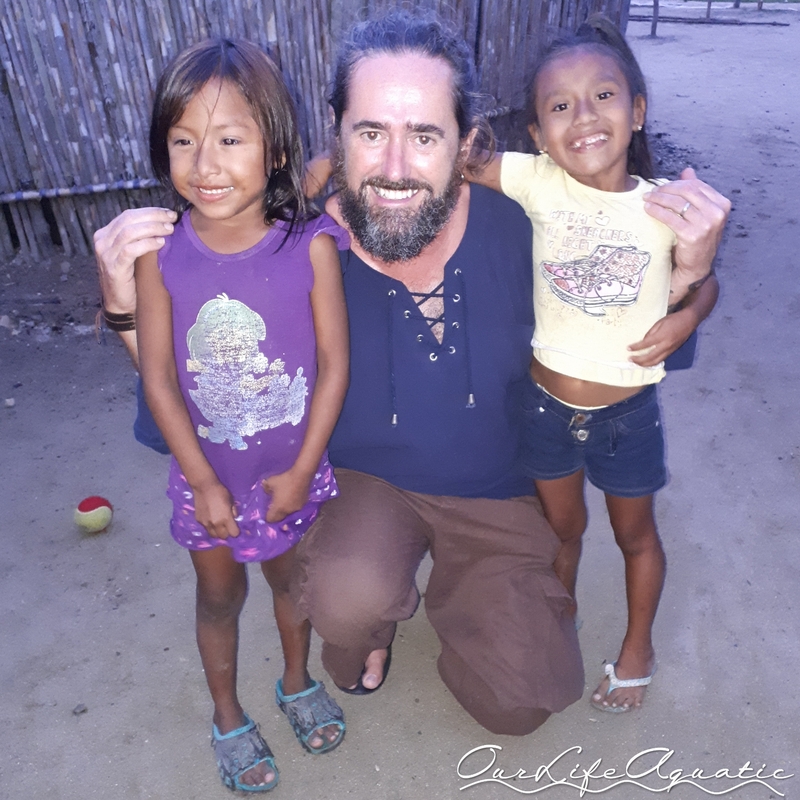 In the more traditional villages, where property is considered a community asset, the Guna will jump right up on your boat to say hello and visit for a bit. In the areas where they have had more frequent contact with outsiders, more western norms of personal space have developed and they will usually ask for permission to come aboard. The one thing that has been constant in all the villages and islands we have visited is politeness, friendliness, and curiosity. They seem as interested in us as we are in them, making for some fun and, perhaps, prolonged conversations. We hope we have been able to convey a glimpse into the culture of the Guna people from a visiting outsider’s perspective. 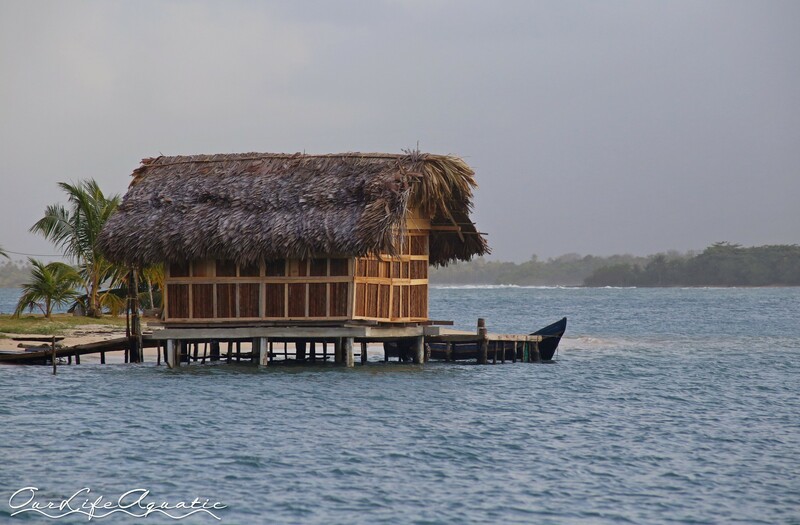 In the next blog we will attempt to describe the startling beauty of the Guna Yala landscape. Stay tuned. Thanks so much, Beth. Maybe one day we’ll try to publish a memoir of our travels. I agree with Beth… write a book! Your blogs are both interesting & educational. I love reading them to Austin (Lauren’s 5 year old). And I can’t say enough about the pics….so beautiful! That means so much, Aunt Brenda. Love that you read them to Austin. Lots of love!